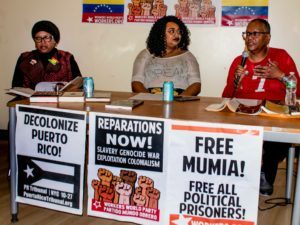 Former U.S. political prisoner Ramona Africa is the Minister of Communication for the MOVE Organization and a Philadelphia-based organizer with the International Concerned Family and Friends of Mumia Abu-Jamal. 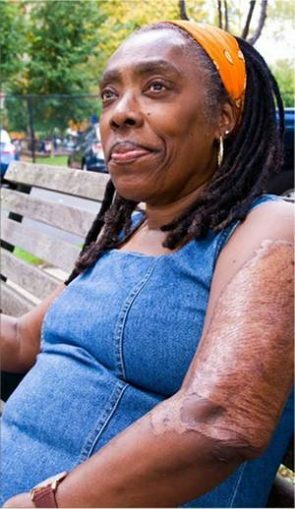 She is also the only living survivor of the1985 MOVE bombing, when the FBI and Philadelphia police dropped two C-4 bombs on her organization’s home, killing 11 people. 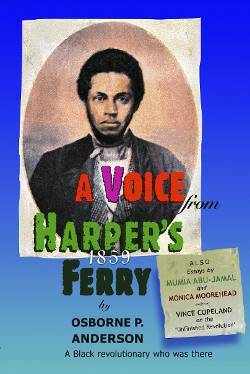 Read along as we discuss the history of MOVE and what it means to be a freedom fighter. Lamont Lilly: Ramona, thank you for sitting down and sharing your time with me. For those who may be unfamiliar, what is the MOVE Organization? Who founded MOVE, and what is the organization about? Ramona Africa: The MOVE Organization is a revolutionary organization founded by a Black man named John Africa. John Africa brought people together from all different backgrounds, nationalities, religions, etc., and gave us one common revolutionary belief. (tinyurl.com/mslchoj) That belief is in the sanctity and importance of all life, on all levels — without exception. And it is that uncompromising belief and uncompromising commitment to life that has put us in direct conflict with the system that we’re living under, a system that doesn’t care anything about life — whether it’s the air, the water, the soil that feeds us. They don’t care. But as members of MOVE, we are committed to life. John Africa even encouraged MOVE women to have babies naturally, at home. He would tell us: “When you’re pregnant, you’re not sick. You don’t need a hospital to do something as natural as giving birth.” No other species of life goes to a hospital to have a baby. LL: You’re so right, Ramona. I’ve never thought about it like that. LL: When did you become a member of MOVE? What period of life was this for you? How did joining MOVE change your life? It was in my last semester at Temple that I started a work-study program because I needed the money to pay for school. I got hired at Community Legal Services, a free legal aid agency. They assigned me to the housing unit. You can’t work in the Philadelphia housing unit without being an advocate for the poor. That’s when I first started getting active in the community. That period marked my first arrest at the Philadelphia City Council. I eventually had to go to court for that arrest and met a brother named Mel there. We exchanged numbers, and he would call me and tell me things that were going on. He called me one day and asked if I wanted to go to a meeting to plan a MOVE demonstration. I lived in West Philadelphia all my life. I had heard about MOVE, but I didn’t really know about MOVE. So I went to the meeting with him. We were supposed to go out that night after the meeting, but I got so wrapped up in the meeting, I wouldn’t go anywhere [laughing]. I was really impressed. The second time I was arrested, the sentencing judge gave me 60 days in the county jail, the “house of corrections.” But you know what? I tell everybody I owe that judge a nod of thanks — a million thank yous because she sent me to the county jail for two months — up close and personal with MOVE women. That was the best thing she could have ever done for me. When I walked out, there was no turning back. I wanted to be like MOVE women and became a member. LL: Do you remember the exact year you joined? RA: Yes. It was 1979. LL: It sounds like you found a higher level of thinking and self-fulfillment. It sounds like MOVE really provided a new sense of wholeness and purpose for you. RA: Yes, for me, but my mother had some issues. She was a beautician by trade, and obviously the first thing that struck her was my hair. She had a problem with my hair because from the time I was knee-high, she would quote “do my hair” by washing it, pressing it, straightening it and curling it. So, when I let my hair grow and lock on its own, oh my goodness. [laughing] She wasn’t too happy about that. This was after the Black Power Movement and long before the current period of being Black and unapologetic. (tinyurl.com/l3nuqbt) A lot of sisters are rocking “naturals” now, but that wasn’t the case in 1979 and 1980. She also took issue with me not going to law school. I didn’t even go to my graduation at Temple University when I finished undergrad. LL: You mentioned “the system” earlier and what it had done. Can you take us back to May 13, 1985? What happened that day? RA: The first thing that people should be aware of is that the bombing took place on Monday, May 13, but the cops came out en masse, surrounding our home, on Mother’s Day, Sunday, May 12. They laid siege on our home, supposedly because neighbors were complaining about us. What MOVE was saying was that we weren’t denying that some neighbors had complaints about us, but name one community in this entire country where some neighbor doesn’t complain about the other. Not only that. When has this government ever cared about Black folks complaining about their neighbors? When did that start? Anyone who believes that is foolish. All you have to do is talk to the Osage residents who still remain there on Osage Avenue. Ask them who they’re complaining about now. They’ve been complaining about the government for the last 31 years because the U.S. government did them wrong. And they’re still pissed about it. Obviously, the U.S. government does not care about Black folks complaining about their neighbors or anything else for that matter. So that “complaining” excuse was just a lie. They started just like they did in August of 1978, with the fire department [who take an oath to run into burning buildings and save lives]. But in May of 1985, they worked with the cops to kill off life, to kill off the MOVE organization. Firefighters turned on water hoses against us, with each hose pumping out 10,000 pounds of water pressure per minute. They had four of those hoses; that’s 40,000 pounds of water pressure per minute. This water was being pumped out for hours, but there was no fire. When that didn’t drive us out, they breached 3-inch holes in the connecting walls of our house. They wanted to blow holes into the walls to insert tear gas. At least that’s what they said. When they finished exploding what they claimed were 3-inch holes in the wall — the whole front of our house was blown away. So, when they started inserting tear gas, a lot of it was just coming right back out. That’s when they opened fire on us, and according to them, shot 10,000 rounds of bullets in on us in the first 90 minutes. They had to send to their arsenal for more ammunition. We were all in the basement. We heard this loud noise that shook the whole house. There was still a lot of tear gas in the house that had not found its way out yet, and it started getting a little warmer in there. As the smoke and gas got thicker, we were like, “Wait a minute, this is something else.” We were listening and could hear the tree in the back of our house crackling as if it were on fire. That’s when we realized that our house was actually on fire. We immediately tried to get our children, our animals and ourselves out of that blazing inferno. But at the point that we were trying to come out and could be seen trying to come out, the cops opened fire on us, forcing us back in. We tried several times to get out, but each time we were shot back into the house. This was a clear indication that they didn’t intend for any of us to survive that attack. But finally, like the third time, we knew that we would either choke to death and be burned alive, or we were going to be shot to death. So, we made one more attempt at it, to get out. I was closest and got outside the door. I got Birdie out. Everybody was lined up to come out after us. It was not until they took me into custody and to the local hospital that I was looking for the rest of my family, but nobody came in. I’m in the hospital and wondering what was going on. I didn’t find out until I left the hospital and was taken to the police administration building [to the homicide unit]. Only then did I find out that there were no other survivors other than me and my young brother, Birdie Africa. (tinyurl.com/kfypm5n) The police were contemplating charging me with the murder of my family. LL: Are you serious? That’s ridiculous! RA: Absolutely ridiculous! They charged me with everything they did: possession of explosives, arson, causing a catastrophe, attempted murder, simple and aggravated assault. But the charges and warrant they came at me with were all dismissed when I was able to challenge them in the pretrial. They eventually dropped those charges. Oh, and I forgot. They also threw in “terroristic threats,” which was ridiculous. LL: So let me get this clear, Ramona. You survived two bombings, the bullets, the fire hoses, the tear gas. You’re out of the hospital, and the next thing you know you’re in the police department being charged with attempted murder and arson? RA: Yep. Yes, I was. And that was another eye-opener for me because when all the charges and the warrants that they came at me with were dismissed, it seems like anything that came from these bogus warrants would have to be dropped as well. If their reasons for being out there were invalid, then how could anything that was a result of their presence be valid? But they were never going to drop all the charges on me. LL: Did you serve time for any of those charges? RA: Yes. I did. First of all, I had a $4.5 million bail. $4.5 million! I was in jail from May 13 of 1985 until May 13 of 1992 because I was convicted of “rioting,” if you can believe that. I was sentenced to 16 months and seven years. When my 16-month minimum was up, I was told by the parole board that they would parole me, but only if I agreed to sever all ties with MOVE. Sever all ties! And I wasn’t about to do that. Instead of being released at 16 months, I did the whole seven years. (tinyurl.com/kty4waf) . LL: Eleven people died May 13, 1985. Excuse me — were murdered! You mentioned children earlier. How many children died in that bombing? RA: Five children and six adults! And not one single official on any level was ever held accountable, ever charged with a single crime against MOVE. But yet, you have the MOVE 9 being called murderers and being imprisoned for 38 years, working on 39 now. Meanwhile, the people that murdered 11 of my family members — publicly on May 13 of 1985 — not one of them was ever held accountable. LL: The last question, Ramona, is in reference to the current movement that we’re actually living with right now — the Movement for Black Lives. 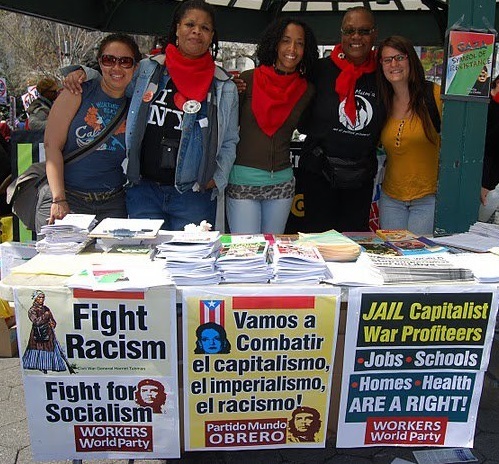 (tinyurl.com/lrb9p5d) As a new generation accepts the baton of mass resistance, freedom fighting and Black struggle, what words of advice would you share? RA: The first and most important thing is to never stop. Don’t ever stop pushing and fighting. Don’t ever give in! Be consistent. Don’t allow yourselves to be disillusioned. Don’t allow anyone or anything to buy you off. Don’t allow yourselves to be compromised or co-opted — because trust me — they will try. ou can definitely believe that! Lamont Lilly was the 2016 Workers World Party, U.S. vice presidential candidate. In 2015, he was a U.S. delegate at the International Forum for Justice in Palestine in Beirut, Lebanon. He is also an activist and organizer in the Black Lives Matter movement.